Teachers and other school personnel may be powerful allies in identifying, assessing and treating OCD. Because they interact with students for extended periods of time during the school year, they are uniquely positioned to observe behavior that deviates from the norm. School personnel, therefore, may play a critical role in helping identify behavior that is symptomatic of OCD. Symptoms of OCD may be apparent during various parts of the school day, including class time, study hall, recess, lunch, or during extracurricular activities. Teachers and other school staff members may notice behavior that signals concern from an academic standpoint (e.g., a drop in grades); socially (student has become isolated and peer relationships have begun to suffer); emotionally (a previously happy student appears to be sad or depressed); or behaviorally (a student starts refusing to do assigned work). If a student is undergoing a mental health assessment, teachers can also provide important information by completing checklists or providing other pertinent student data (number of absences from school, test scores, grades, etc.). This information can be very helpful in providing mental health providers a more well-rounded picture of a child’s overall functioning. Once a child or adolescent is diagnosed with OCD, school personnel can play an extremely important role in treatment by providing the student any necessary supports for functioning successfully in school. 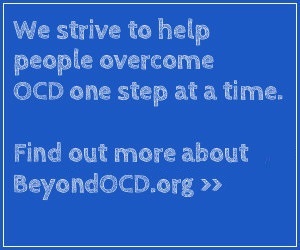 Beyond OCD created a special web site called the OCD Education Station, which has a wealth of information for teachers and other school professionals on this topic. Many schools offer accommodations to help children who have OCD. In severe cases, help may be available under federal law for children with disabilities. When a student’s OCD has a negative impact on his or her school functioning, he or she may be eligible for various school-based services. For many students with OCD – frequently those with milder cases – those services may be obtained under Section 504 of the Rehabilitation Act of 1973. Section 504 is a civil rights law that protects individuals with disabilities from discrimination. Therefore, an educational program must be designed for students with disabilities to meet his or her individual needs to the same extent that the needs of students without disabilities are met. In other words, Section 504 essentially levels the playing field for students with OCD. Interventions in the form of accommodations are documented in what commonly is referred to as a “504 plan.” Accommodations include providing extra time to take a test, allowing a student to do a written assignment on the computer instead of writing by hand, and countless others. Many students with OCD, particularly those with more severe cases, may receive services under the Individuals with Disabilities Education Act of 2004 (IDEA), the federal law governing special education and related services. To be eligible for special education services under IDEA, a student must be between the ages of 3 and 21 (or as defined by state law) and meet the definition of either a preschool child with a disability or one or more of 13 disability categories listed in IDEA (experts in the field strongly recommend that students with OCD be identified under the IDEA category “Other Health Impaired”). Moreover, the disability(ies) must have an adverse effect on the student’s learning, social and emotional functioning. A comprehensive evaluation is required to determine if a student has a disability that negatively affects his or her school functioning. If a student does meet eligibility criteria under IDEA, an individualized education program, or IEP, must be written. The IEP is an extremely detailed written document outlining all special education and related services the student should receive. It essentially serves as a blueprint for how the child is to be educated. As a parent, trying to determine if your child is eligible for services and if so, whether to seek them under Section 504 or IDEA, can be confusing. A brief comparison of these two laws may be helpful. In many cases, Section 504 is the appropriate vehicle for providing needed accommodations and interventions for students with OCD. Section 504 provides a quicker and more flexible means for supporting these students in the school setting. Section 504 may also be preferred over IDEA by parents and students who fear potential stigma associated with special education and related services. However, the requirements for a free, appropriate, public education are more detailed under IDEA than in Section 504. IDEA also includes more rights and safeguards for students with OCD and their parents than Section 504. Therefore, if a student with OCD is struggling with academic, social, and/or behavioral problems, it may be preferable to seek special education and related services under IDEA. Talk with other parents whose children have already experienced problems with OCD in school and ask them what approach they took as well as the type of services their child received. Attend a local support group for parents of children with OCD. It is likely that some or even many of these parents will have worked with school personnel to obtain supports and accommodations for their children. They may be able to provide invaluable suggestions about how to approach schools as well as how NOT to approach schools. Learn more about the Individuals with Disabilities Act and Section 504 of the Rehabilitation Act of 1973 (web sites containing more information are listed in the More Resources section of this web site). If you are encountering great difficulty with the school in your attempts to get services for your child, you may want to consider contacting an expert in special education or an attorney who specializes in disability law. He or she will be able to provide important information about your child’s rights to a free, appropriate education.